My wife and I were looking at property in Telluride for three years before we purchased. Adam consistently and without complaint kept contacting us with new listings and kept us informed of market conditions in connection with the recession. This information over time helped us to jump on an opportunity when it came up last winter when we were finally ready to purchase. Adam had all units with our qualifications lined up and ready to view when we arrived in Telluride. He made sure that we saw every possible property, even after we made our decision. Adam even helped with closing by helping to track down information from the homeowners association and flood zone information. We owned a previous unit in Mountain Village several years ago and had a poor experience from one of the larger brokers in the area. 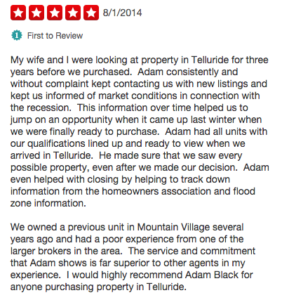 The service and commitment that Adam shows is far superior to other agents in my experience. 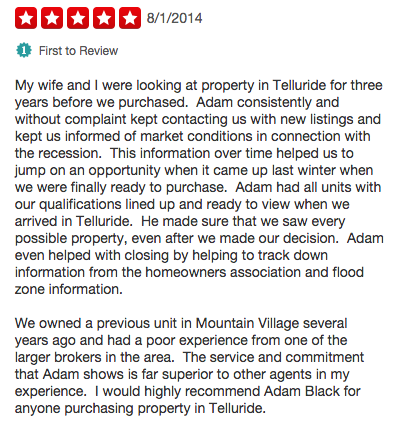 I would highly recommend Adam Black for anyone purchasing property in Telluride.